The spray painted 90 foot Norway Spruce at my Grandmother’s farm in 1949. A man stands at the base. December first naturally brings with it the guilt that I have yet to decorate our Christmas tree. Decorating the tree produces a little bit of stress. There are two people in my family who embrace decorating the tree, and I’m one of them. The other? 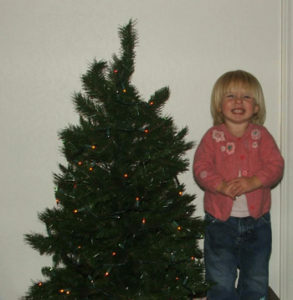 Well, the year she was in England during Christmas, I decorated a smaller tree with sad faces in commemoration of her absence. sticking those little color coded branches in the appropriate slots in the name of safety and sanity, last year I moved our family back to the “real tree” category. 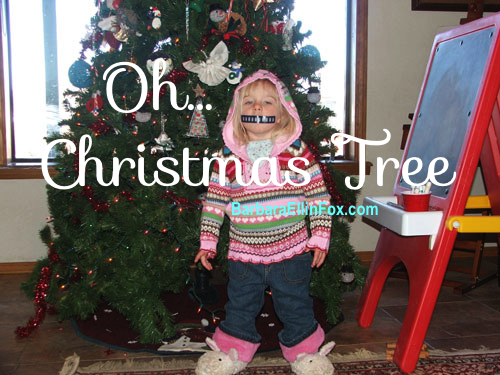 Even as I chuckle about the Christmas tree mishaps we’ve had over the years, a particular Christmas tree ties my sisters, cousins, nieces, nephews, and all the grands together. A letter from my oldest sister, Mary, refreshed this story. 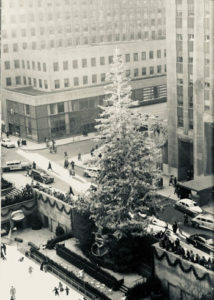 In 1949 a Norway Spruce was chosen from my Grandmother’s farm on Long Island to decorate Rockefeller Center in New York City. 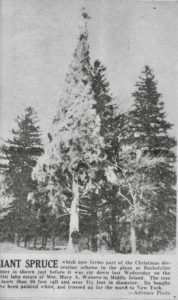 The tree stood between seventy five and ninety feet tall, and before it’s three and a half foot trunk was cut, the tree was sprayed with several hundred gallons of white paint to make it look like snow. My sister remembers the event. Mary Elizabeth Walters (my grandmother) and her family, including grandchildren were present when she (Grandma) lit the tree for the opening ceremony. I would have been nine months old, and if I attended, I don’t remember! It’s fun to think about Grandma’s tree when I watch Hallmark Christmas movies. Emma liked the tree that was her size. And then there was this guy- Joey. (Long Island. Fishing line.) and laid down the law to my two little girls not to touch it. And over the years there have been various kittens who climbed into the tree. Several dogs ate Christmas stockings. We had trees that fell over. There were short trees, tall trees, the tree my granddaughter loved because it was her size. 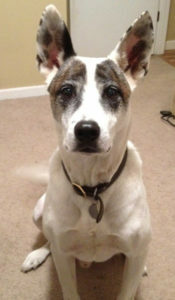 And then there was… Joey, (in the picture) who actually believed because we had a tree in the house we must be outside. Yes, you guessed it. Joey did what male dogs do to trees in the OUTSIDE world, only he was comfy and warm inside the house. One can only imagine what this year’s tree will endure with my daughter’s Golden Retriever puppy, Bailey! Whew. I guess we’ll pick up the tree on Wednesday and decorate, leaving the fragile ornaments in the box this year. Oh, incase you’re wondering, at six months old Bailey may be a little energetic, but at least she’s a female! Have wonderfully blessed holiday as you prepare to celebrate our Savior’s birth. PS. Just so you don’t peg me for censorship or as an unkind grandmother, the black strip across my granddaughter’s mouth in the header picture was a self-applied label she she found on a container. How neat Barbara that your grandmother’s tree was in Rockefeller Center. I enjoyed hearing about the trees your family had over the years. Have a beautiful and merry Christmas!! Your mishaps bring back so many memories, and always it’s the children that make it special. Even as I write this, I’m trying to decide what size tree to use this year. … the big one I love, or a smaller, table top size to keep the babies from undecorating it.